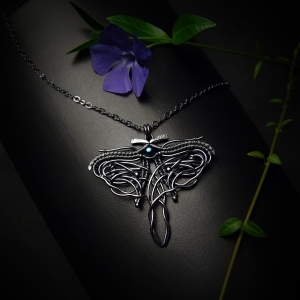 Short necklace with a handcrafted pendant resembling a moth adorned with a navy blue pearl. The piece has been heavily oxidised and polished. Fine and sterling silver hand formed in various metalwork techniques. The pendant is 4.5cm long and 5cm wide. The chain is 41cm long plus 10cm of extension.